More clues into NASA’s long term goal of sending humans to Mars have been provided in the latest revision of the Space Launch System (SLS) Concept of Operations (Con Ops) presentation. The document confirms the agency is siding with a version of the Mars Design Reference Architecture 5.0, utilizing multiple SLS launches, including nuclear stages, over an extensive timeframe. 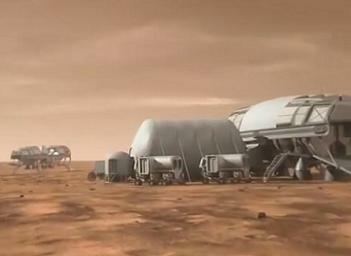 Sending humans to the Red Planet is, and always has been, a long term ambition of many in the United States. Curtailed by the need for vast amounts of funding and political support, along with continued challenges associated with maturing deep space technology, the prospect of humans on Mars has always appeared to be decades away. Politically, directing NASA toward the enabling of missions to Mars is a problem, given the agency’s funding cycles rarely project beyond the short term. Lawmakers would have to commit billions of dollars, without a full understanding of the long term economic environment, whilst possessing the knowledge they would be no longer in office nor able to reap the political rewards of such an historic mission being successfully achieved. However, while an astronaut wandering around on the Martian surface in a NASA spacesuit may be a distant dream, the United States still has an ace in the hole-a driven young billionaire named Elon Musk. The leader, not only of SpaceX, but also the meteorically rising Tesla Motors and creator of PayPal, made his intentions known when he said he wants his company to push towards human missions to Mars, not least because he wants to go himself. Citing his ambition in helping humanity become a multi-planetary species, Musk, backed by his growing company and large pools of cash, is highly likely to beat NASA to Mars, as much as that may eventually involve a level of cooperation between SpaceX and the agency. With the above funding constraints in mind, a full blown exploration plan continues to be in the preliminary planning phase. 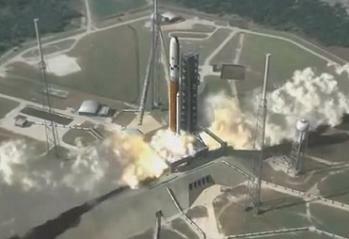 Currently, only two missions are manifested for NASA’s new fleet involving the Space Launch System (SLS) and Orion, namely Exploration Mission -1 (EM-1) and Exploration Mission -2 (EM-2). With Near Earth Asteroids (NEAs) providing the stepping stone approach to returning NASA to deep space exploration, managers hope the experience gained in long-duration missions will enable the technology for making the big leap towards Mars. The NEA missions in the 2020s will mature several key elements that will be required for trips to Mars, with SLS evolving into at least its Block 1A/B 105mT configuration, Orion gaining deep space mileage, along with the opening flights of the Deep Space Hab (DSH). However, far more technology will be required, as acknowledged in the latest Mars Mission planning effort, outlined in the revised 116 page Concept of Operations (Con Ops) document, available to download in L2. 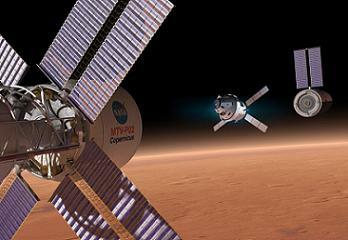 “Missions to Mars, including the moons of Mars – are a major goal for human exploration. The architectures to accomplish these missions continue to be assessed and there remain many architectural and technology implementation options under evaluation,” noted the presentation. “Over the past several decades, numerous Mars architectural studies have been conducted, each of which concluded with very similar key driving capability needs (with) a list of the key driving capabilities associated with the Orion, SLS, and Ground Operations projects as they pertain to potential Mars missions. 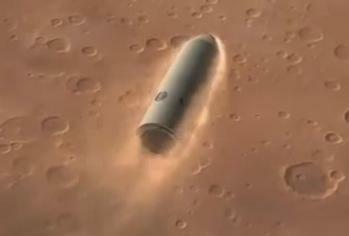 At least two of the main architectural studies are employed in the current planning effort, such as the Flexible Path approach to potentially aiming for one of the Martian moons, prior to a landing on Mars, along with the Mars Design Reference Architecture 5.0 approach, which appears to be highly favored in the latest Con Ops document. Currently, NASA’s Design Reference Mission (DRM) planning list the two approaches as MAR_PHD_1A – for a mission to Phobos, with MAR_SFC_1A as the Mars Landing mission. 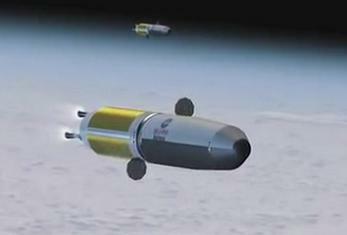 Other key differences between the Flexible Path and 5.0 approaches include the number of launches required per mission, with the Flexible Path citing the requirement of 10-15 HLV launches – via the use of chemical (LH2/LOX) rockets, while the 5.0 overview involves a launch campaign using seven HLVs, sporting nuclear propulsion stages. All approaches involve the HLVs launching huge stages into Low Earth Orbit (LEO), where they would rendezvous and dock, prior to setting sail for Mars. “Mass to LEO: The required mass delivery to LEO is highly dependent on the in-space transportation technology implemented and type of mission conducted. Conjunction class long-stay missions typically require lower total mass and fewer launches than the more aggressive opposition class short-stay missions,” noted the Con Ops presentation. 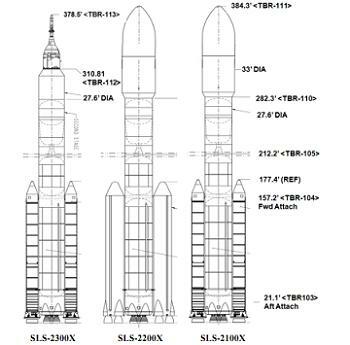 The 5.0 approach involves seven HLVs launching the major elements of three vehicles using NTR (Nuclear Thermal Rocket) propulsion, namely the MLV Cargo Vehicle – created from two HLV launches, the MLV Habitat Vehicle – created from two HLV launches, and the MTV Crew Transfer Vehicle – created from three HLV launches. All three vehicles would be assembled in Low Earth Orbit. 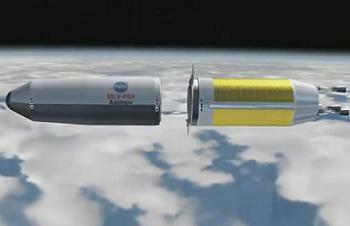 During a campaign – as shown in a video made available to L2 – the first two HLV launches are focused on sending up the two major elements known as propulsive stages. These stages are placed into LEO, in order to wait for the rest of the vehicle elements to arrive for rendezvous. 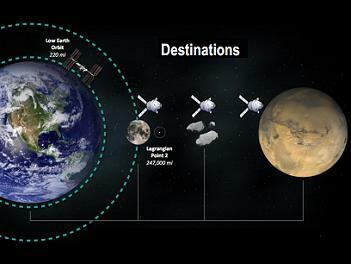 Each of these elements rendezvous and dock with their propulsion stages in LEO and depart en route to Mars. The Payload Shroud Dimensions gained a level of evaluation in the Con Ops document, noting they are equally important, as the mass delivery to LEO is the associated payload volume. The Payload Shroud Shape is also deemed to be an important consideration, given the primary options for Mars EDL utilizes the SLS payload shroud as the Mars entry aeroshell. The specifics of the shape (e.g., bent bi-conics) and how that affects SLS launch performance is still under evaluation, according to the document. Vitally important for the launch phase is the spacing of each element heading uphill ahead of their eventual departure to Mars, not least from a ground processing aspect, but also in relation to the optimal windows to make the transit to the red planet. “Total launches and launch spacing: The total number of launches required for a Mars mission includes the launches needed for the cargo missions, which pre-deploy assets to Mars, as well as the launches needed for the crew portion of the mission. “The number of launches is highly dependent on the in-space transportation technology utilized, the mission mode, and whether or not a mission to Mars is conducted every opportunity (every 26 months). Per the 5.0 approach, the first two Mars vehicles will both arrive at Mars first, with the cargo lander separating from its propulsion stages ahead of a decent to the Martian surface aided by three large parachutes and six descent engines. 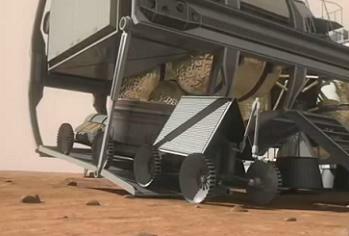 Numerous vehicles are hosted on the cargo lander, including Space Exploration Vehicles (SEV), a robotic cart rover – used to set up the deployment of the Fission Surface Power System (FSPS) and radiators – and a large amount of related hardware, all of which is designed to set up a base for the astronauts. NASA documentation also claims the most mass-efficient means of providing high power for surface missions is through the use of nuclear fission systems. The next phase of the campaign would involve three SLS’ tasked with launching the major elements of the Mars Transport Vehicle (MTV), with the hardware deployed and rendezvous in LEO. 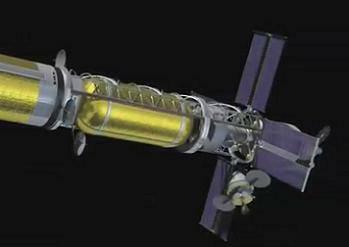 This vehicle would include a DSH and the Orion the crew will eventually splashdown in upon their return to Earth. The crew would then launch to the assembled vehicle on another Orion, which is undocked as the crew ingress the MTV. Arriving at the Red Planet aft first – to allow for deceleration – the MTV would carry out a propulsive Mars Orbit Capture manuever. The crew would then enter the attached Orion, undock from the MTV and dock with the orbiting Habitat Lander waiting for them in Mars orbit. The Orion would then undock unmanned and redocks with the MTV, as the Habitat Lander – now containing the crew – begins its descent to the Martian surface. Considerations for the amount of time the crew would spend inside the Orion is also outlined in the Con Ops, citing the need for Orion to be able to cope with long periods of the mission in a dormant state. “Orion Total Active Crew Duration: Most Mars architectural approaches require crew delivery to LEO at the beginning of the Mars mission as well as return of the crew via direct Earth entry at the end of the mission. 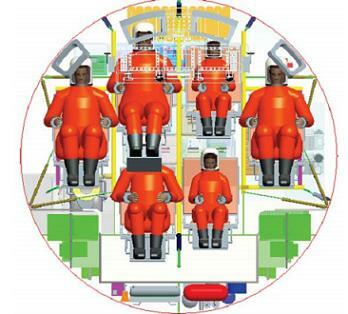 These operations typically require no more than the planned 21 days of active crew duration within the Orion. 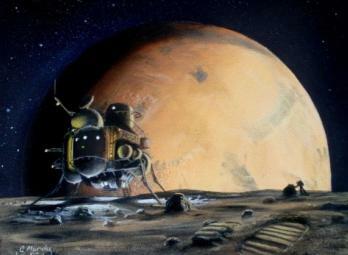 Under this mission profile, the crew could spend as long as 500 days exploring Mars (Surface Exploration Phase) via EVAs both on foot and via the use of SEVs – stationed at a Martian base, consisting of the two landers, and other erected support structures, including an inflatable habitat linked by an airlock and hooked up to one of the landers. The other lander is staged a short distance from the base structures, which is where the astronauts will translate to during their final moments on the planet. The 5.0 approach shows this vehicle using three large engines to launch the crew off the surface and back into Mars orbit where they rendezvous and dock with the MTV. 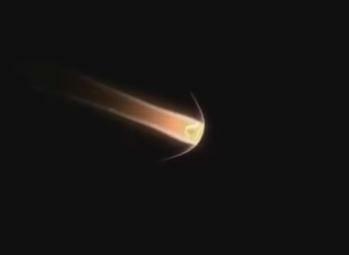 Shortly after docking, the MAV – along with any contingency consumables – is jettisoned whilst still in Mars orbit. 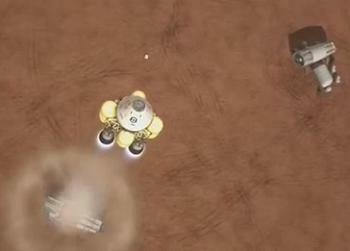 The MTV again fires its three engines and the crew begin their trip back to Earth. The crew’s re-entry at the conclusion of a mission to Mars will be the biggest test for the Orion’s heat shield, as evaluated by the Con Ops team. 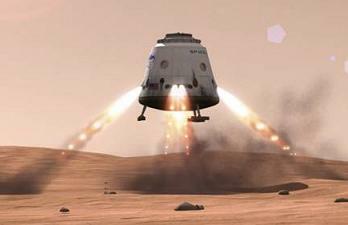 “Earth Entry Speed Limit: The typical approach used for return of the crew at the end of a Mars mission is via direct entry. Mission design techniques utilized for Mars missions try to find a good balance between the transit times, total mission duration, total mission mass, and entry speed at Earth arrival. Additional considerations are made in the presentation, citing “key driving capability” options. As such, two approaches – both siding with the 5.0 architecture – are listed, namely the “Most Probable Architectural Approach” and the “More Aggressive Architectural Approach”. Both approaches have similarities, such as the insistence on using nuclear propulsion and surface capabilities. However, the aggressive approach revolves around a crew of four conducting a longer mission, versus the probable approach of sending a crew of six on a shorter sortie. The Con Ops team concluded that the larger crew holds a number of advantages, ranging from risk reduction, to the potential to add international crew members on to the roster. The latter is highly likely, per the potential to reduce the financial burden on NASA. While the aggressive approach lists the requirement for the Block 2 130mT SLS as the HLV to loft the hardware into LEO, the probable approach provides some flexibility, citing the Block 1A/B 105mT SLS may be able to achieve the required results. Other items of interest include payload return from Mars, with the plans allowing for a placeholder for 250kg of materials to be transported from Mars to Earth. The Con Ops claims that assessments conducted by the Mars Exploration Program Assessment Group and Human Exploration of Mars Science Analysis Group have shown that the capability to return up to 250 kg of payload is necessary to meet future scientific, human research, and engineering design goals. What is certain is such missions will not be conducted prior to the 2030s, meaning such plans will continue to receive additional revisions and refinements over the coming years.